Phonographic Copyright (p) – Edgar Rice Burroughs, Inc. Published By – Universal Music Publishing International Ltd. Published By – EMI Music Inc. This compilation ℗ + © 2016 Philip Collins Limited under exclusive license to Rhino Entertainment Company, a Warner Music Group Company. Made in the EU. Tracks 1-1 to 1-10 & 1-12 to 2-13 ℗ and © 2016 Atlantic Recording Corporation for the world ex UK and Eire. ℗ and © Philip Collins Ltd for the UK and Eire under exclusive license to Rhino Entertainment Group, a Warner Music Group Company. Track 1-11 ℗ 1984 Sony Music Entertainment under license from The Sony Music Custom Marketing Group, a division of Sony Music, a group of Sony Music Entertainment Inc. Tracks 2-14 to 3-4, 3-9 to 3-11, 3-14 & 3-15 ℗ and © 2016 Philip Collins Ltd under exclusive license to Rhino Entertainment Company, a Warner Music Group Company. Tracks 3-5 to 3-8 courtesy of Walt Disney Records. ℗ 1999 the copyright in this sound recording is owned by Edgar Rice Burroughs Inc and Walt Disney Records under license to Rhino Entertainment Company, a Warner Music Group Company. Tracks 3-12 & 3-13 courtesy of Walt Disney Records. ℗ 2003 Walt Disney Records, under license to Rhino Entertainment Company, a Warner Music Group Company. 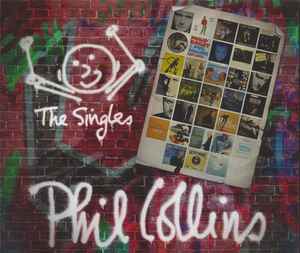 This compilation ℗ + © 2016 Philip Collins Limited under exclusive license to Rhino Entertainment Company, a Warner Music Group Company. Plastic case, 24 page booklet. One would expect that a release called "The Singles" would consist of the single versions and radio edits of all songs. But not by Warner's logic. It's all album versions here. A shame really, and a missed chance to make this release really worthwile.